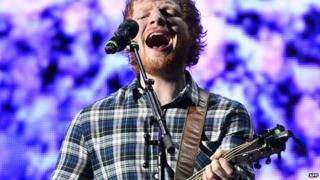 British singer Ed Sheeran has surprised a young girl in Canada by performing an impromptu duet at a shopping mall. In a video on YouTube, which has been viewed around 90,000 times, Sheeran was in a music store when he overheard a cover of his hit Thinking Out Loud. The voice belonged to 13-year-old Sydney Bourbeau, performing at a fundraiser for Edmonton Humane Society. "It's the best thing that's ever happened to me," she told the Edmonton Journal. The teenager remained surprisingly calm as the Brit-winner joined her on stage and later explained: "I didn't want to stop, but I wanted to talk to him." Sheeran left the stage after the performance, stopping to pose for some selfies with fans along the way. Bourbeau was later texted by Sheeran's manager offering her two tickets to the singer's concert in the city on Sunday. He is currently on a tour of Canada and North America.